Home > News > Product Knowledge > Which Equipments are needed for the Construction Wastes Disposal Line? Which Equipments are needed for the Construction Wastes Disposal Line? Luoyang Dahua construction wastes recycling process relies on the construction waste disposal production line to crush the construction wastes and regenerate green building materials. So, which equipments are needed for a construction wastes disposal line? In the macroscopic sense, the construction wastes disposal equipments mainly consist of two kinds: mobile type and fixed type. With regard to the mobile construction waste disposal equipment, it has good mobility, and the filed operation is convenient and flexible, but the output and demand are limited. 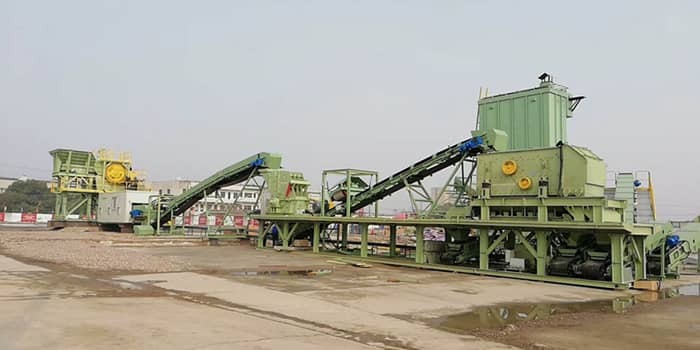 While the fixed construction waste disposal equipment, which can be referred for the construction waste processing production line, comparing with the mobile crushing station, it has higher output. Impact crusher is the most used and reasonable equipment in construction waste disposal production line. Besides the impact crusher, the production line should include vibrating feeder, vibrating screen, and belt etc. for better and the more convenient service for the construction waste processing line. Next Article: Which Type of Feeding Machine should be used for Stone Transportation?